Pre-Assembled Buildings which are also known as ‘Chattels’ were first documented being used in Adelaide, Australia many years ago back in Eighteen Hundred and Fifty Three. The Religious Order of Friends, a Quaker church, was built right beside Saint Peters Cathedral, and was supplied by Henry Manning of London. The pre-assembled building still stands strong today, here in 2014, and is regularly used and serves as a meeting house. Chattels were also used to provide a shelter for many emancipated slaves, in Barbados, who were not able to legally own land there, but the portable structures allowed them to easily relocate their shelters if requested. Today, we have companies like Panel Built who provide many similar structures to the old fashioned chattels, who now offer a wide variety originating from Henry Manning’s ingenious idea. Pre-assembled modular and In-plant office(s), as well as, guard booth(s), shack(s) and house(s) are shipped back and forth every day in Twenty Thousand and Fourteen’s busy world of industry and security. Pre-fabricated guard booths are most commonly found serving their purpose at a gatehouse entrance. They are loaded with closed circuit television monitors to survey the surrounding areas of the entrance to make sure that no person or vehicle makes it through into the assigned territory the security officer has been assigned to keep watch of. Often at times the places which need guards stationed at their gate are private home owners and their communities and so the guard also operates a mechanical barrier arm to let vehicles pass. Some communities may use auto gates but more often than not, depending on the area and situation, intruders will disrespectfully lift the arm to drive below It or just simply drive through the gate arm destroying it and costing the land owner great amounts for repairs and reinstallation. These days many guard shacks are portable and the best you can buy can be found online sold through companies like Panel Built. You don’t have to purchase a standard or basic guard shack, they are fully customized to the customers personal requirements including their choice on colours, interior and exterior design, specific safety features and internal design of electrical, communication and data ports. 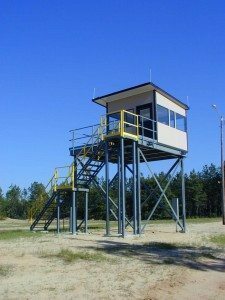 As these guard houses are portable and very easy to move they may be used on the fly to accommodate guards that are stationed for long periods of time in areas where environments are harsh or quite often suffer from bad weather. In-plant offices are not always used within a plant or factory. Most common pre-fabricated buildings are used on construction sites. Not only do the pre-fabricated offices keep administrative employees safe and clean from debris and dust that is most commonly found on plots that are under heavy construction, but they also make for clean break rooms where all employees can store their personal items, make a cup of tea or coffee and eat their lunches preserving them from exposure to the many construction site contaminants in the air. Those who have not been on a construction site might be surprised to learn that many foreman for some clients or jobs might find themselves loaded down heavily with paper work, plans or blue prints. Having pre-fabricated houses on site during these jobs are a highly necessary means to those working there. This house would enable the workers to be able to fill out or review the paper work and discuss the logistics of the job in a building away from the loud noises on the site, and also a safe place to store documents which could get lost on the site, destroyed or blown away in the wind. Equipment is costly and although this is stating the obvious some equipment is so costly that it is wise to invest in a modular enclosure when you find that you have to leave some equipment out at your site or place of business overnight. More cost effective and practical than setting up full on guard booths, why not protect that equipment instead? Pre-fabricated shacks or sheds are sound means to keep your best equipment locked away from possible overnight theft while no one is on site or a place to haste-fully store the equipment if the weather suddenly turns bad and heavy storms bring in rain over your work area and exposed expensive tools, machines, materials and devices. Even for home use – Long term modular sheds can be insulated to house lawnmowers and gardeners equipment keeping it safe from rust. A generous one time expense may pay off over the years by extending the half life or your favorite sheers, hoes, rakes, plows and mechanical lawn management devices which might short during use if wet from having been left out in the rain or under automatic sprinkler systems.